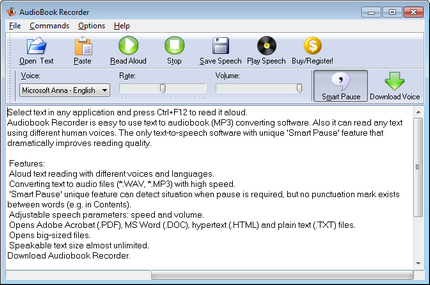 Audiobook Recorder is easy to use text to audiobook (MP3) converting software. Also it can read any text using different human voices. The unique 'Smart Pause' feature can detect situation when pause is required, but no punctuation mark exists between words (e.g. in Contents). Adjustable speed and volume improve text recognition. It opens PDF, DOC, HTML, FB2, PDB, TXT and RTF files as well as converts them to WAV and MP3 files. Qweas is providing links to Audiobook Recorder 1.27 as a courtesy, and makes no representations regarding Audiobook Recorder or any other applications or any information related thereto. Any questions, complaints or claims regarding this application Audiobook Recorder 1.27 must be directed to the appropriate software vendor. You may click the publisher link of Audiobook Recorder on the top of this page to get more details about the vendor.